Nearly 67 million U.S. citizens travel outside of the country each year. If you’re like most of these travelers, you’re probably away from home for a week or two at the most. But what if you find that you’ll be leaving home for months on end? Whether you’re embarking on a cross-country road trip or relocating to Australia, you may find you need to store your possessions. In this case, long term storage units are a great choice. Here’s everything you need to know about renting a long term storage unit as well as other options for storing your belongings. Storage unit facilities realize that one-size-fits-all doesn’t apply to their customers, so units are usually available in a variety of sizes. Most storage units range from a 10’x30′ (300 square feet) size to one that can hold a vehicle or the equivalent of four rooms’ worth of furniture. This means the cost per month ranges to fit a customer’s budget and storage needs. Which size unit is best for you really depends on what you need to keep safe while you’re away. Most items that are kept in storage units can withstand drastic changes in temperature and any humidity. But if you plan on storing certain items that can get damaged by high dew points or extreme cold or heat, opt for a climate controlled storage unit. Valuables that may need a climate controlled unit include upholstery, leather and wooden goods, musical instruments, important documents, artwork, magazines, and newspapers. A climate controlled unit usually maintains a temperature between 65 and 80 degrees. You will pay a higher fee for a climate controlled storage unit. But the extra cost is worth it for the peace of mind you’ll have knowing your items are unaffected by weather changes. If you’re storing items in a region that experiences humidity and extreme heat or cold, you may want to strongly consider renting a climate controlled unit. Storage unit facilities allow you to store a variety of items including the usual possessions such as furniture, clothing, and toys. However, there are some items that are strictly prohibited from storage units. To be on the safe side, anything edible should be left out of storage units as it can attract rodents and insects. Also avoid using boxes that previously held food, including fruit, as it smells like food and can attract pests. Cash also isn’t allowed in storage units because insurance policies don’t cover it. You’d be better off keeping any cash lying around safely in a savings account. 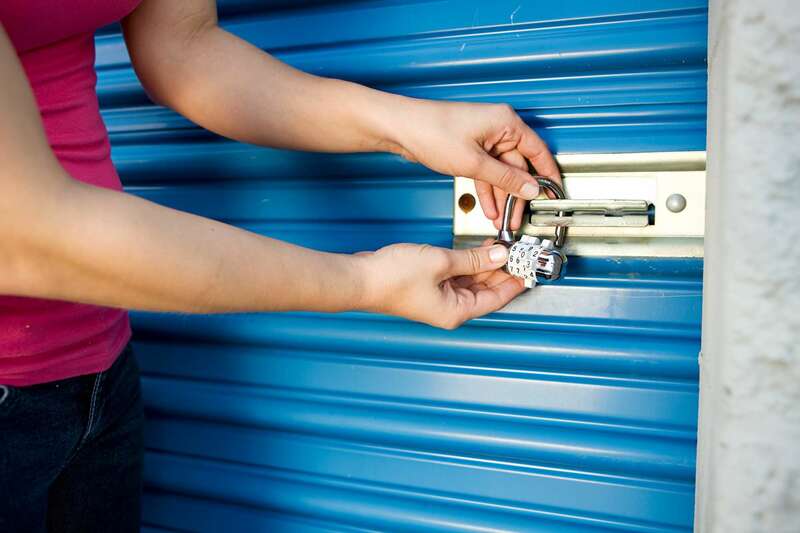 When in doubt about what you can and cannot keep in your storage unit, check with the facility. Perhaps the biggest benefit of using a long term storage unit when you’re traveling is you’ll know your possessions are safe and secure. Most facilities have security cameras and lighting to deter thieves and to keep an eye on their customers’ rented units. Some storage unit facilities offer discounts and specials for first-time customers or those planning on renting a unit long-term. This is another benefit of using a storage unit while you’re traveling for an extended period of time. Do your research and check around with storage unit rental facilities near you to find out what discounts may be available. Of course, you can always check with your family and friends to see if they have an extra space in their home for your belongings. Most of the time this isn’t convenient for people, particularly if they’re parents and have a lot of toys and their kids’ items in their house. However, it doesn’t hurt to ask. You may want to offer the person “rent money” as an incentive for safekeeping your items. Give the person a firm date as to when you’ll be able to haul your possessions away and stick to it. You may want to hold a yard sale in the months leading up to your departure date to minimize the number of items you have to store. Ebay, Craigslist, and Facebook Marketplace are other good options to lighten your load and make extra money. This will also add storage space to your current home. You can also recycle or donate many items to charitable organizations. Big Brother Big Sister and The Epilepsy Foundation are two examples of charities seeking donations. They’ll also pick your items up curbside on a specified date. Be sure to check with the charity’s website to ensure the items you have in mind are currently accepted. There may be items that are simply too old or worn to donate. If you can’t give them away to a new home, it may be time to throw it away. You’ll feel better knowing you have less work to do when it comes time to pack up your items for storage. Whether you use a storage unit or can store items with a trusted friend or family member, be sure to pack items properly. Use plastic bins and other clean, sturdy storage containers for easy stacking. This will help your items take up less space. As you can see, there are many benefits to renting long term storage units, especially if you’re going to be away from home for a while. They can be affordable and they keep your valuables safe and secure. Here at Florida Independent, we enjoy bringing you content to help you make the most of your busy lifestyle. For more helpful travel tips, see our latest travel and entertainment posts.